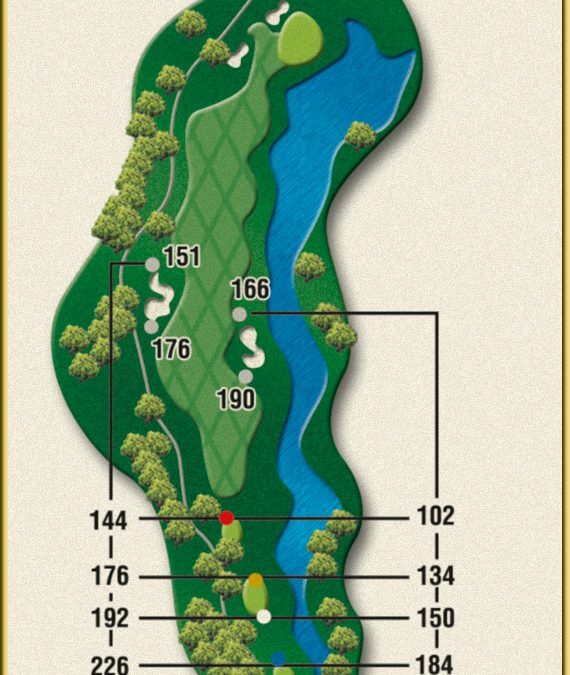 The 4th hole at Crow Creek Golf Club is a challenge for golfers due to the lake that runs the entire length of the hole along the right hand side. This 325 yard (from the white tees) par 4 does not provide and issue from a yardage standpoint. It is the water that makes it a tough play. Most amateur golfers have a tendency to slice the ball, especially off the tee box. That can spell disaster and lead to a big number of the scorecard at the end of the hole. Trees guard the left hand side of the fairway of No. 4 so with the water along the right side, visually the fairway can look quite small from the tee box. Players need to consider what the proper club is to play off the tee. Less than driver might be the play for golfers that tend to slice the ball off the tee. With the hole only playing 325 yards it can still be managed with a fairway wood or hybrid as the tee shot. Not being in the lake is the number one goal off the tee. Once in the fairway players still have to deal with the lake on the second shot into the green. Left is the smart miss but can be a challenge also. There are two bunkers of the left side of the green that await any bailout shots. The green is big and round and provides a nice target to hit to. So no matter whether golfers are using a longer club into the green due to laying up off the tee box or a short iron, the putting surface is a nice, welcoming target to play into. Players just need to be mindful of missing right. Crow Creek has some of the best greens along the Grand Strand. Once players reach the putting surface they should be thinking they can walk away with two putts at the worst. The green on No. 4 is not a difficult green to read or putt. A good approach shot should give a birdie look. A two-putt should be no problem. There are many good holes and Crow Creek and No. 4 is right up there as one of the more challenging holes on the course. It really makes a player think and and hit shots in order to be able to right a good score on the scorecard. To make a tee time click on the “Tee Times” button at the top of the page or call the golf shop at 910.287.3081.